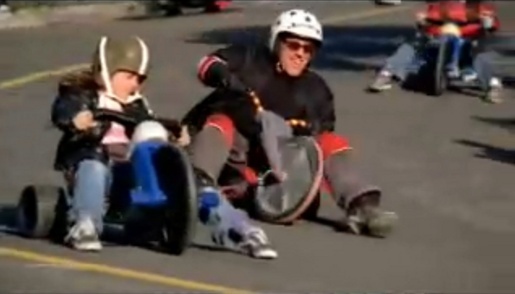 Toyota promoted the eight seater Sequoia at the Super Bowl with an ad featuring trike racers. In a bid for mums and dads, the ad includes the lines, “The Dishes Will Wait. Life Won’t”, and “Good for Eight Crazies”. Music is “Mongoose” by Fu Manchu, a band from San Clemente, California. The Trike Racer ad was developed at Saatchi & Saatchi LA, Los Angeles, by executive creative director Harvey Marco, creative director Erich Funke, art directors Conan Wang and Erek Vinluan, copywriters Ned McNeilage and Mike Zulawinski, senior producer Jennifer Vogtmann, and director of integrated production/multimedia Damian Stevens. Filming was shot by Lance Acord via Park Pictures. Editor was Chan Hatcher at Rock Paper Scissors. Online editing was done at Radium by Inferno artist Joana Sruz. Sound was mixed by Loren Silber at Lime Studios, Santa Monica.